Nylon 12 is a popular FDM material that is used in traditional manufacturing processes. In the following article, our academy trainers will cover several different considerations to think about when you are printing in Nylon 12. With Nylon 12, the smaller the slice height the better the part aesthetics and surface finish. Larger slice heights can improve strength and toughness by up to 10% and build speed by 30% or more. 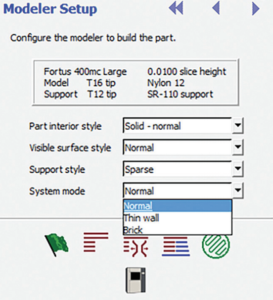 The build modes adjust the oven temperature to control the crystallisation rate and avoid melting or warping problems for various wall thicknesses. Please note: users should select the build mode based on the thickest portion of the part geometry. 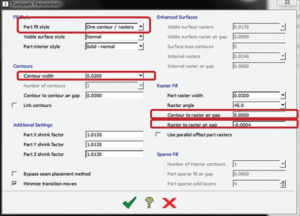 There are three interior tool path variables to consider that can change the porosity of a part. Nylon 12 is quite a sticky material. A sacrificial tower feature has been added to the Control Centre in the Insight Software to help increase part quality. When packing a job in Control Centre, selection the options button & check the ‘Include sacrificial tower box’ in the pack options pop-up window. Nylon 12 parts will be pliable at oven temperature. To maintain dimensional accuracy, either cool the oven to 75oC before removing the part, or remove it by handling the build sheet only. For more information on printing with Nylon 12, or any of the other Stratasys thermoplastics – please get in touch with our team!